Organic semiconductors are becoming increasingly important, promising a paradigm shift in wearable electronics. There is an urgent need to elucidate the fundamental physics of these materials. Here Dr Kai Lin Woon and Dr Thomas Whitcher describe their recent paper in Journal of Physics: Condensed Matter, in which they evaluate the electrostatic model at interfaces. Click here to read the full article. The interface between two materials is very important as it governs the charge injection/extraction, and to a certain extent the efficiency of the device. There are numerous models used to describe it, including the electrostatic model which does not invoke the existence of integer charge-transfer states. However, the validity of the model has not been rigorously tested. Figure 1: Comparison of the measured and simulated potential change of the five samples with different thicknesses of poly(N-vinylcarbazole) (PVK) used to determine the energy-bending in the PEDOT:PSS/PVK interface via ultraviolet photoelectron spectroscopy (XPS) analysis. Inset: Normalised XPS of the N1s peak showing a shift in binding energy towards lower energies as the thickness of PVK decreases. © IOP Publishing, All Rights Reserved. In our paper in the Journal of Physics: Condensed Matter, we compare this model with experimental results for both simple and complex interfaces for the first time. 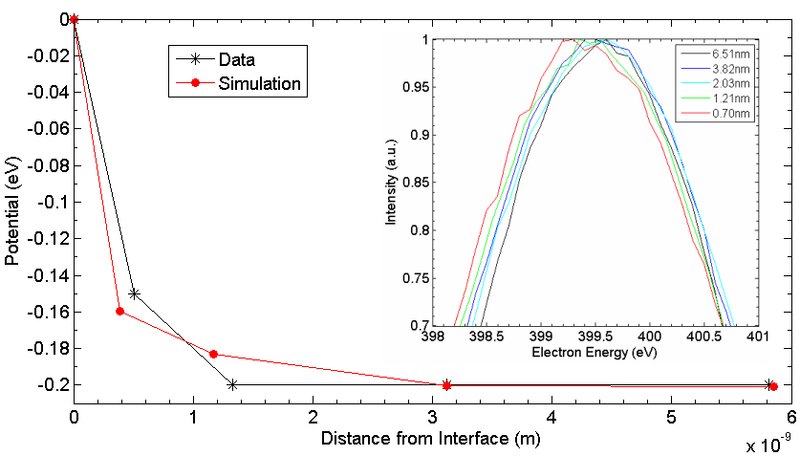 We determine the accuracy of the model in simulating energy-bending in a wide variety of interfaces between any two materials using Thailand Synchrotron Light Source. We further extend the model to cover blended mixtures of materials and also compare them to experimental data. Good agreement is found. 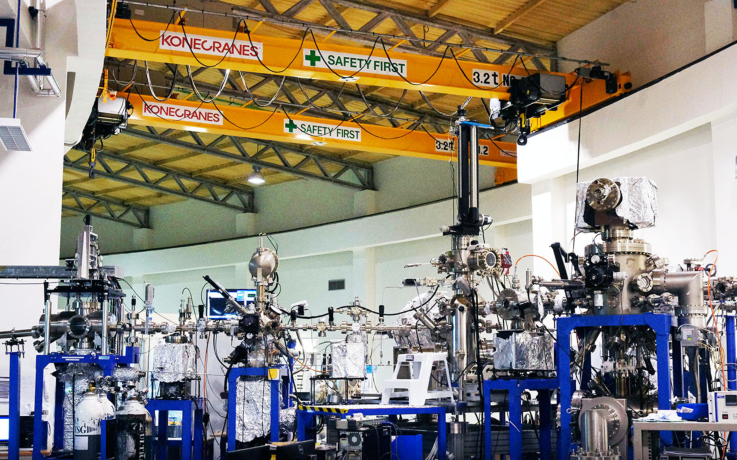 Figure 2: Photoemission experimental station of the BL3.2 at the Synchrotron Light Research Institute. © IOP Publishing, All Rights Reserved. With the validity of electrostatic model tested, further investigation into the effect of the Gaussian Density of States width on energy-bending is warranted. 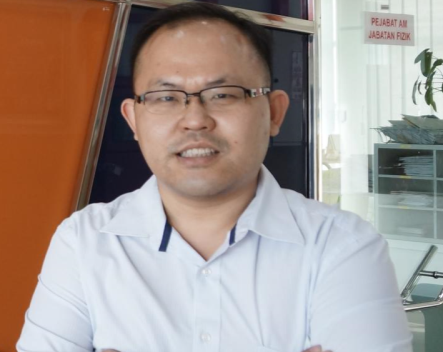 This work is a result of collaboration between Thailand Synchrotron Light Source and the Physics Department of University Malaya led by Dr. Kai Lin Woon. Kai Lin Woon received his PhD degree in Physics from University of Hull, UK in 2005. 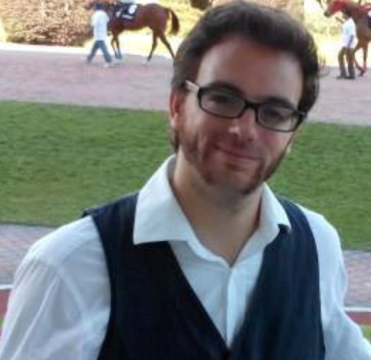 He worked as a postdoctoral research associate in University of Hull for two years and Oxford University for one. He also spent 2 years in OSRAM as an OLED Material and Device Specialist. He is now a senior lecturer in Physics department, University Malaya. His main research interest is organic semiconductors physics. Thomas James Whitcher received his PhD in Physics from University of Oxford in 2011 by exploring warm dense matter using X-ray Free Electron Lasers. He was a research fellow in University of Malaysia from 2012 to 2016 using X-ray diagnostics techniques to investigate the energy levels of organic semiconductor. He is currently a beamline manager at Singapore Synchrotron Light Source.